a) Candidates should have passed 10th class exam in March 2019.
b) Candidates should not have completed 18 years of age as on 31.12.2019, If students belonging to SC and ST categories should not have completed 21 years. c) International students shall be of Indian Nationality / Persons of Indian Origin (PIO)/Overseas Citizen of India (OCI) Card Holders. AP Rgukt IIIT Application Fee : Rs. 150.00 (for OC and BC candidates) Rs. 100.00 (for SC and ST candidates). An additional amount of Rs. 25.00 per application should be paid as service charges to the AP Online Centre. The candidates should apply to ap iiit 2019-20 through AP Online services only. Candidates have to note that the mentioned dates are tentative for AP IIIT notification 2019 and they can be changed as per the requirement by the Rajiv Gandhi University of Knowledge Technologies, Andhra Pradesh authority. (PH/CAP/NCC/Sports) for all four campuses. i) Admission to 85% of total available seats shall be reserved for ‘local candidates’(Andhra Pradesh) and the remaining 15% of the seats are open to the students of Andhra Pradesh and Telangana states as specified in the Presidential Order 371 Article D in consonance to Section 95 of the A.P. Reorganization Act, 2014. (see Annexure-1). ii) The rules of reservation for different categories are as under in both local and unreserved categories, subject to any changes and amendments made by the Government of Andhra Pradesh. i. SC – 15%, ST – 6%, BC-A – 7%, BC-B – 10%, BC-C – 1%, BC-D – 7%, BC-E – 4%, Physically Handicapped (PH) – 3%, Children of Armed Personnel (CAP) – 2%, NCC -1% and Sports – 0.5%. iii) A horizontal reservation of 33 1/3 % of seats in favor of women candidates in each category (OC/SC/ST/BC/Special Categories) shall be ensured, wherever women candidates are available. iv. In case of PH candidates, certificates issued by the State Medical Board alone are acceptable. For Sports and CAP categories, certificates issued by the respective District Boards are acceptable. These reservations are applicable at state-level. Model proformas for certificates are given for all the above categories in Annexures. v) Since the courses offered are technical in nature and require appropriate physical fitness, RGUKT reserves the right of rejecting the application of such candidates who are declared by the experts as physically unfit to pursue the course. Candidates can check AP Rgukt IIIT Admission Selection List 2018 by clicking the relevant link it is available on Rgukt website . You must check your name in the Rgukt IIIT Admission Results 2018 on Rgukt official website. 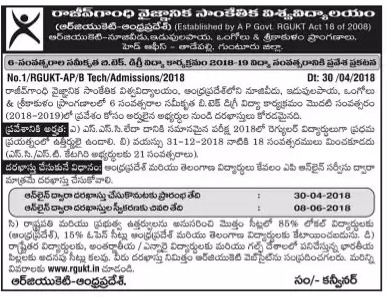 Candidates can check AP IIIT notification 2019, Rgukt IIIT application form 2019-20, ap iiit rgukt rk valley, ap iiit rgukt nuzvid results, rgukt nuzvid admissions 2019, rgukt admissions 2019, iiit idupulapaya pulivendula, how to apply iiit after ssc, how to get admission in iiit colleges, iiit notification after ssc, Ap Rgukt iiit admissions 2019-20 rgukt iiit admission notification 2019 through this article.